There are many things to examine when deciding on a new vehicle. While design and utility are important, the performance of the vehicle will probably be the determining factor more times than not. If you happen to be in need of a midsized sedan with good performance, then the Nissan Sentra should definitely be on your radar. When you get to the lot at Basic Auto Sales, the performance features of the Sentra will become more tangible. If power is what you desire most, then the Sentra SR Turbo has you covered with a 1.6L DIG turbocharged engine that outpaces other Sentra models by 50 per cent and reaches a top end 188 horsepower. To make rides even smoother, there is the available Xtronic CVT transmission. This transmission comes with preprogrammed shift points that give a traditional transmission feel while being as efficient as possible. 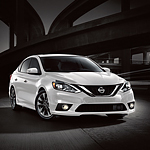 An option of this transmission with manual shift mode is exclusively available with the SR Turbo model Sentra.